Happy Sunday friends! 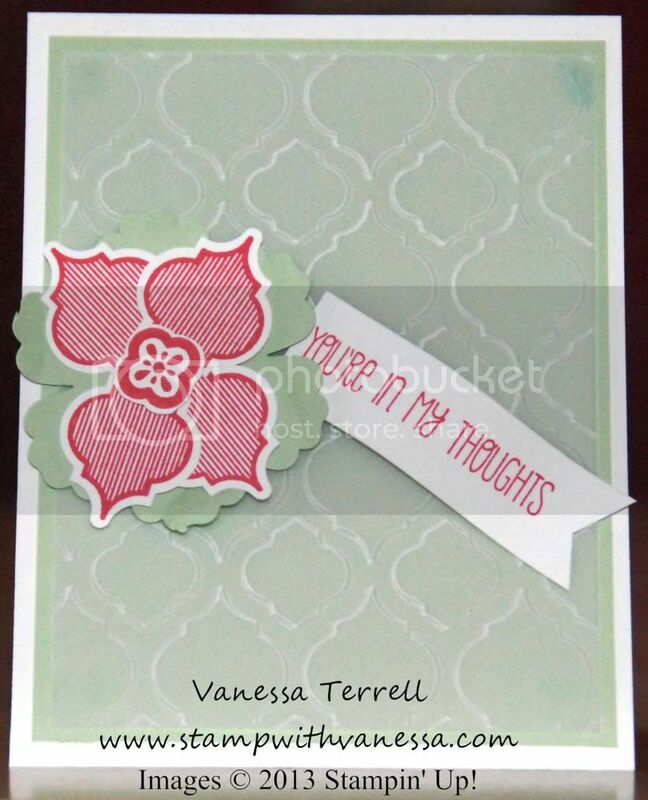 Today I used A Dozen Thoughts stamp set to create a Thinking of You type of card. My stash of that type of card is getting low and that I better make some and I was in need of one to get in the mail. So I went back to some previous card designs that I liked and came up with something that would work, but changed it up a bit! Today I used Vellum cardstock...I haven't worked with Vellum in a long time. So it was fun to pull it out and work with it again, I also used the Mosaic Madness stamp set and the coordinating embossing folder - Modern Mosaic. Here's my finished card. For a fun twist...I layered the pieces that I punched out using the Mosaic punch on top of the Blossom punch.